It doesn't matter whether you ride English or western, the basics of saddling up are the same. The goal is safety and comfort for both horse and rider. These instructions apply whether you use an English or Western saddle. Shown in this step-by-step tutorial is an English saddle, but all of the steps also apply to a western saddle. Where there is a difference in doing up the cinch, you’ll find information so you’ll learn to tighten your cinch safely. Start with your horse safely tied. Brush your horse’s back and girth area being careful to remove any dirt or grit that may cause chaffing under the saddle or girth. Brush so all the hair lies flat. Check the girth area as well, and brush or sponge away any dirt or mud. Leaving any grit on your horse's back or girth/ cinch area can lead to painful galls or irritations that can make your horse misbehave. It is traditional to saddle from the near side (left side) but you should be able to saddle from the right (offside) if necessary. An English saddle pad may be shaped to fit neatly under the saddle and may have ties or hook and loop fastener tabs that attach to a D-ring on the saddle and help keep it in place while riding. These tabs or ties go on the top side, not against the horse. Place the saddle pad or blanket on the horse’s back, positioning it forward over the withers and sliding it back into place. 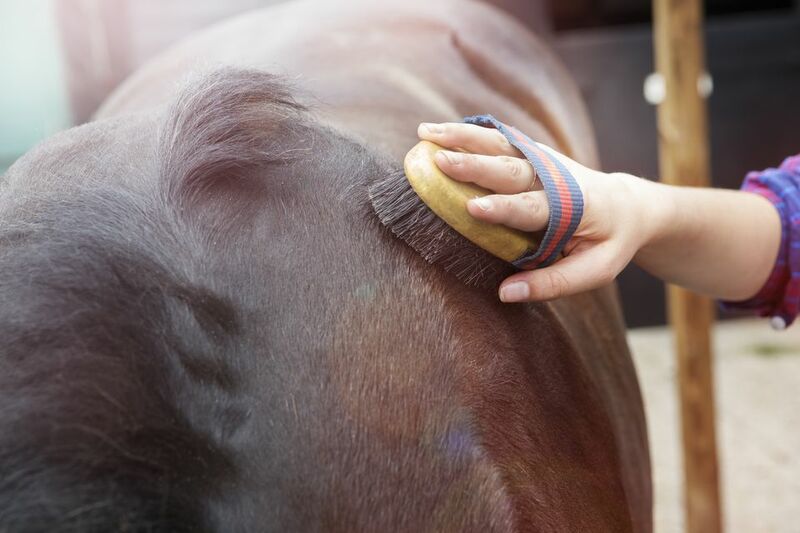 This ensures that the hair on the horse’s back lies flat beneath the pad and saddle. Make sure the blanket or pad is even on both sides. Check both sides to be sure that the pad or blanket is not folded, wrinkled, or rolled anywhere. The stirrups on an English saddle should be run up the leathers, and the offside stirrup of a Western saddle should be hooked over the horn or folded over the seat. This is so the hard stirrup doesn’t hit you or the horse as you lift the saddle. 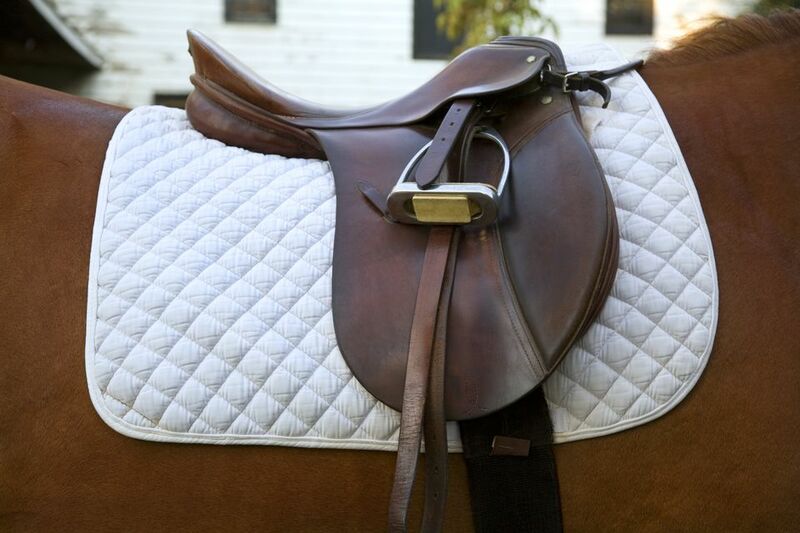 The girth or cinch, if they are attached, should be folded back over the saddle seat. Some people take their English girth off the saddle completely each time they finish riding. This helps prevent the billet straps from being twisted when the saddle is stored. If you remove the girth after each ride, of course, you’ll have to buckle up both sides when you saddle up. Lift the saddle high enough that it doesn’t hit the horse or knock the pad out of position. The saddle should be placed slightly forward and settled back. Be careful to place the saddle gently on the horse’s back. Letting a saddle fall heavily onto your horse’s back may cause it to spook or resent being saddled (become ‘cold backed’). Move to the offside to take the stirrup down on a Western saddle and check the pad or blanket so there are no wrinkles beneath the saddle on both sides. If the girth or cinch is not already attached to the offside, buckle, or tie it. Check again that the blanket or pad is flat and that the hair beneath stays smooth and lying in the natural direction it grows. Wrinkles in a blanket or pad can cause galls or cause discomfort that could make your horse misbehave. Move to the near side, reach beneath the horse, and pick up the free end of the girth or cinch. Either buckle the girth or tie the cinch up loosely. Tighten the girth or cinch gently in small increments. It’s common to girth a horse up suddenly and tightly, causing the horse to kick or bite. This can cause the horse to resent being girthed up and become ‘girthy’. Some horses may bloat themselves in anticipation of discomfort. Ask the horse to step forward, wait a moment for it to exhale and tighten the girth gently again. Only tighten the girth enough to hold the saddle firmly in place. Some riders feel the tighter the girth the more secure they will be. There should be no need to make link sausage out of your horse by over-tightening the girth — this can lead to injury and may compromise your horse’s breathing. You should be able to slide your fingers between the girth or cinch and your horse. If there are tabs at the front of your saddle pad, loop them through the D-rings at the front of the saddle and tie or fasten them. For the last step, make sure there are no wrinkles in the skin under the girth. Stand at your horse’s head facing back. Pick up one front leg by holding the pastern or low on the canon and stretch it forward. Do this for both front legs. As a horse works you may find the girth becomes looser. Always check the girth before mounting and again after a few minutes of riding.